In 2012, the poet Traci Brimhall said I had to talk to Ruth Awad. Ruth has a lot of tattoos and she is a damn fine poet. Ruth and I have emailed back and forth for four years (and in the mean time, at least a dozen other poets said, "Ruth is tattooed!"). 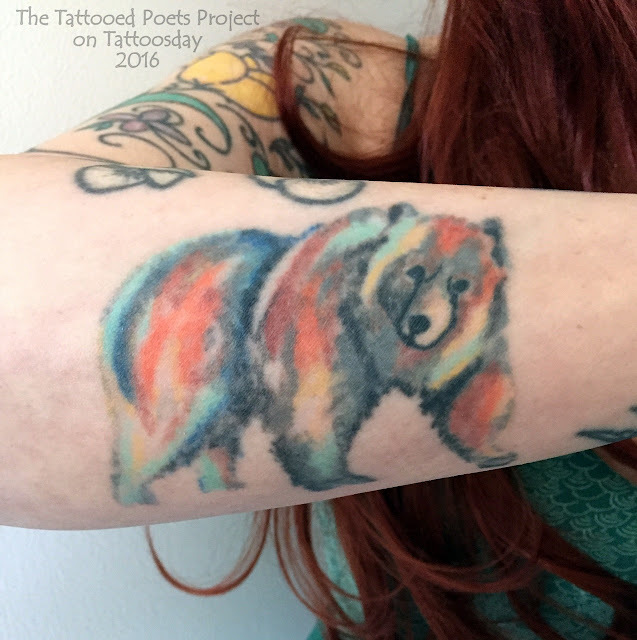 Well, the planets finally aligned in 2016 and I am happy to have Ruth and her work appearing on The Tattooed Poets Project. Ruth calls this her "poppy fox bunny sleeve" and credits Roger Ziegler, owner of Bomber Crew Tattoo in Carbondale, Illinois. She adds that Roger "has a real talent for creating depth and detail with color, and he's one of the few artists who isn't my mother who has tattooed me." 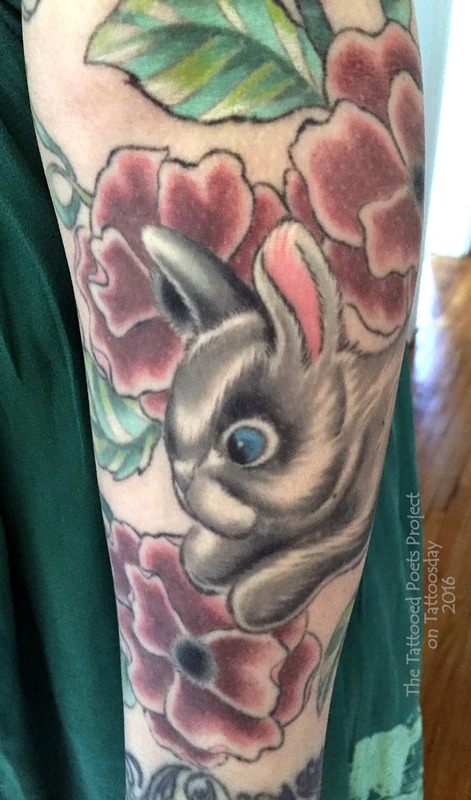 "Like nearly all of my tattoos, this one was done by my mother Deborah Stevenson. She used to run her own tattoo shop and art gallery in East Nashville, Tennessee, and I hope she opens another shop one day. She's incredible, and I'm not just saying that because I'm her daughter." I'd have to agree her work is remarkable. "These are about a decade old now and could use a touch up. Anyway, Marty, the tattoo artist who trained my mom, did the swallow under my right collarbone as a kind of test for her when she was an apprentice – she had to make the left one match his (she did a fine job, too). Marty died a few years ago – it's interesting to think about a tattoo artist's work outliving them in this very literal way in someone's skin." 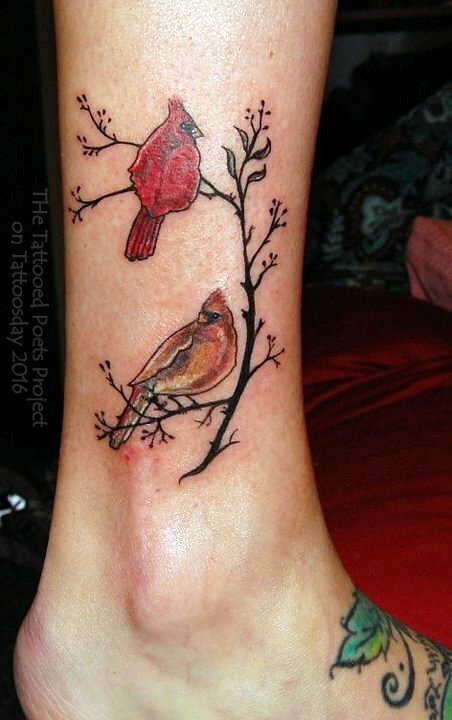 "I tattooed these birds on my own ankle a few years ago. I was probably bored, and I immediately regretted the decision after I tattooed the first line – it was a hard pose to maintain! Wouldn't do that again, but I'm pretty happy with the result." Not bad for tattooing oneself, I must admit. every moment we lived in the ground. When shame becomes your phantom hand that digs its nails into its fist. When you move it like a muscle just to feel your skin tighten. counting each pixel of flesh as I peeled the fabric from my body. Become a worse animal. Let your quills pin their eager hands to the dirt. and your weight on top of it. Your wife and kid waited at home. But I could feel them, too. I am the yarrow at your heel, leave your starved with me. Your chest rising the way a bow draws an arrow. tastes like: knowing I could have him, even then. made me want to see just how cold I could be. and take out the world with one bite. Out of the garden and into the bog. if I don’t get in my own way. the faucet beads into the basin. Be the space between each drip. In the kitchen his calloused hand pins my thigh. but the body is already bones and dirt. You can bury it anywhere. Ruth Awad has an MFA in poetry from Southern Illinois University Carbondale, and her work has appeared or is forthcoming in The NewRepublic, The Missouri Review Poem of the Week, Atticus Review, Crab Orchard Review, CALYX, Diode, Southern Indiana Review, Rattle, The Adroit Journal, Vinyl Poetry, Epiphany, The Drunken Boat, and in the anthologies The Hundred Years' War: Modern War Poems (Bloodaxe Books, 2014), New Poetry from the Midwest 2014 (New American Press, 2015), and Poets on Growth (Math Paper Press, 2015). She won the 2013 and 2012 Dorothy Sargent Rosenberg Poetry Prize and the 2011 Copper Nickel Poetry Contest, and she was a finalist for the 2013 Ruth Lily Fellowship. She lives in Columbus, Ohio, with her husband and two Pomeranians. 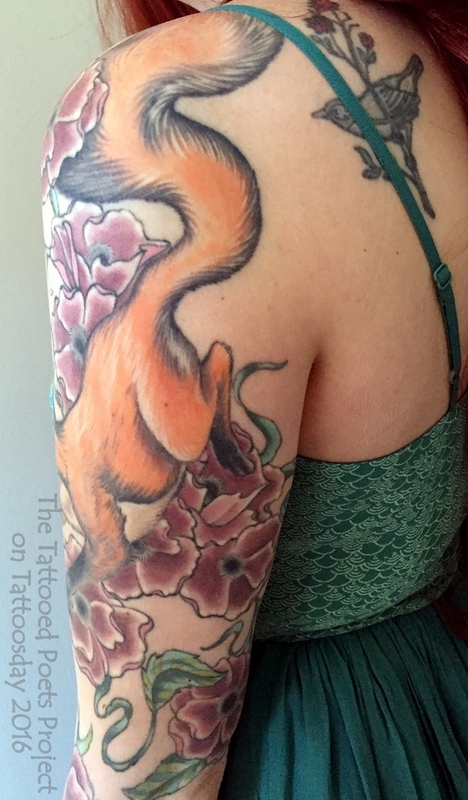 Thanks to Ruth for sharing her poem and her amazing tattoos with us here on Tattoosday's Tattooed Poets Project!